Richer Poorer’s Boxy Crop Tee is my new favorite t-shirt. I wait for it to be clean when it’s in the laundry, like a kid waiting for their dad to come home from the war. If you’re not familiar with Richer Poorer’s basic wares, the brand is based in California and creates high-quality clothing out of organic cotton. They have a special wash technique that makes all their shirts feel and look like they’ve been worn and washed and loved by you right out of the bag. Now, back to the t-shirt. 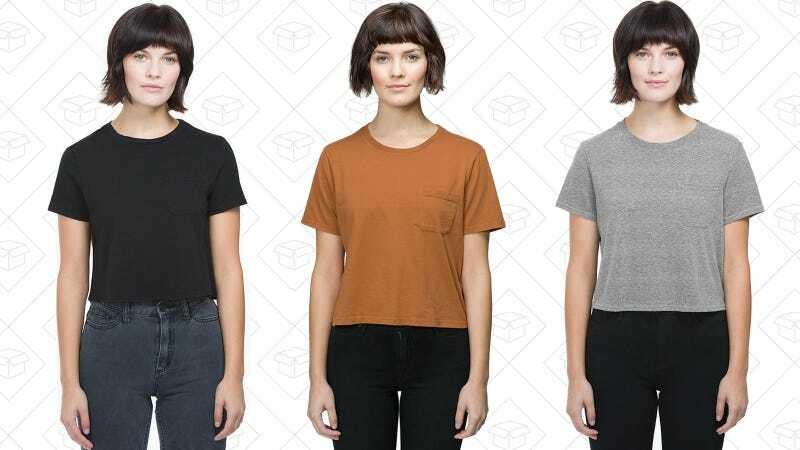 Cropped tees are incredibly hard to get right, especially the length, but The Boxy Crop Tee has a self-described “goldilocks crop.” The brand took their classic Crew Neck Tee and chopped it off at the waist. It’s a work-appropriate length too, hitting right below the waist band of a pair of high-waisted jeans. What I really love about the tee is that the sleeves aren’t too long, which is a common complaint I have with t-shirts, especially cropped styles. I can easily cuff them if I want, or leave them un-cuffed and loose. When I raise my arms, you get a little bit of belly showing, but it’s also possible to tuck in some of the excess fabric (being a boxy cut helps with that) and it stays put. I got the color tobacco, which is a beautiful orangey-brown and it looks great paired with denim, but I’ll be picking up a couple more colors in the near future so that I can forever rotate between perfect t-shirts.